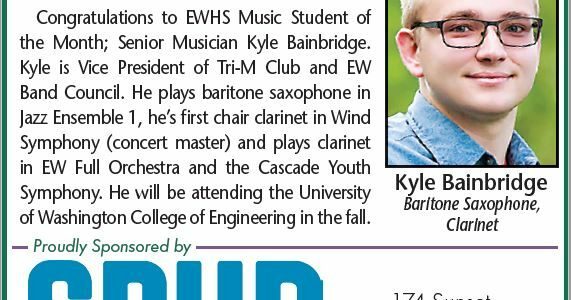 Kyle Bainbridge named newest EWHS Music Student of the Month! Swing Dance Event April 14th! April 14th from 7-10pm (swing dance lesson begins at 6:30pm) at Edmonds Senior Center (220 Railroad Ave). Tickets (available at door) are $10, $5 for seniors. Music by EWHS, College Place and Madrona jazz bands. Buy at Amazon & Give to EWHS Music!